Make no mistake – you will rarely see a film as visually arresting as The Fall, which is replete with wide-angle landscapes of South American jungles, ancient Chinese cities, bright-orange deserts, aquamarine seas, and cobalt-lacquered villages. Even the opening credits sequence – which details in slow-motion a rescue mission extending from atop a railroad trestle – is the most pristine black-and-white footage since the Polish Brothers’ Northfork. There are also unending visual motifs involving swimming elephants, exotic butterflies, locomotives, oranges, and dentures, all servicing a would-be child’s fable whose true identity is a phantasmagoria of pretentiousness. Set a Los Angeles hospital circa 1915, a five-year-old girl named Alexandria (Romanian newcomer Catinca Untaru) is recovering from a broken collar bone when she meets lonely Roy Walker (Lee Pace, TV’s Pushing Daisies), a silent movie stunt man convalescing from severe leg injuries. Roy begins spinning a fantastic yarn for Alexandria in a convoluted effort to eventually coax her into pilfering enough morphine so Roy can kill himself. The story’s professed framework is Roy’s personal life and is populated by characters – such as a freed slave, Indian warrior, and a young Charles Darwin – played by people in the hospital and Roy’s life, a la The Wizard of Oz. If only The Fall were even that simple. A surrealist fever dream – influenced by Dali, Jodorowsky, et al. – masks an incomprehensible storyline divorced from both reality and genuine emotion, unlike, for example, Guillermo del Toro’s Pan’s Labyrinth, another fantasy dreamscape generated by a young girl’s imagination and despair. Beyond its rank illogic, the performances are amateurish, particularly Untaru, whose did not speak English when shooting originally started and, judging by her incoherent babble, never bothered to learn it. 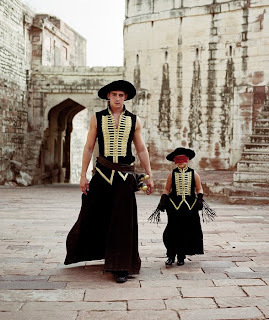 Some high-brow cinephiles may buy into Tarsem’s indulgent vision and audacious rendering of the symbiotic relationship between storyteller and listener, or – as elucidated during the film’s mildly sublime final sequence – between filmmaker and audience. Frankly, The Fall is tailor-made for armchair aesthetes who gape at a canvas smeared with dung and then breathlessly brood over the life force of the animal that shat it.